Western Asia, West Asia, Southwestern Asia or Southwest Asia is the westernmost subregion of Asia. The concept is in limited use, as it significantly overlaps with the Middle East (or the Near East), the main difference usually being the exclusion of the majority of Egypt (which would be counted as part of North Africa) and the inclusion of the Caucasus. The term is sometimes used for the purposes of grouping countries in statistics. The total population of Western Asia is an estimated 300 million as of 2015. Although the term "Western Asia" is mostly used as a convenient division of contemporary sovereign states into a manageable number of world regions for statistical purposes, it is sometimes used instead of the more geopolitical term "Middle East". a Area and population figures include the Sinai. In an unrelated context, the term is also used in ancient history and archaeology to divide the Fertile Crescent into the "Asiatic" or "Western Asian" cultures as opposed to ancient Egypt. 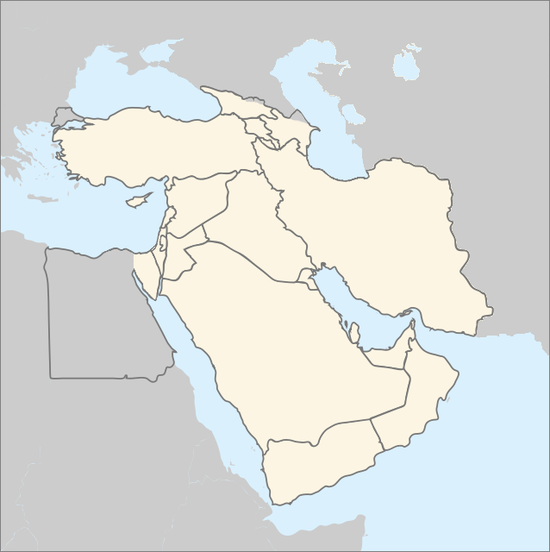 As a geographic concept, Western Asia includes the Levant, Mesopotamia, Anatolia, Iran, the Armenian Highlands, the South Caucasus, the Arabian peninsula as well as the Sinai Peninsula, making Egypt a transcontinental country. The term is used pragmatically and has no "correct" or generally agreed-upon definition. The National Geographic Style Manual as well as Maddison's The World Economy: Historical Statistics (2003) by the Organisation for Economic Co-operation and Development (OECD) only includes Bahrain, Iran, Iraq, Israel, Jordan, Kuwait, Lebanon, Oman, Qatar, Palestinian territories (called West Bank and Gaza in the latter), Saudi Arabia, Syria, Turkey, UAE, and Yemen as West Asian countries. In contrast to this definition, the United Nations Industrial Development Organization (UNIDO) in its 2015 yearbook also includes Armenia and Azerbaijan, and excludes Israel (as Other) and Turkey (as Europe). Unlike the UNIDO, the United Nations Statistics Division (UNSD) excludes Iran from Western Asia and includes Turkey, Georgia, and Cyprus in the region. In the United Nation's geopolitical Eastern European Group, Armenia and Georgia are included in Eastern Europe, whereas Cyprus and East Thracian Turkey are in Southern Europe. These three nations are listed in the European category of the United Nations Educational, Scientific, and Cultural Organisation (UNESCO). National members of West Asian sports governing bodies are limited to Bahrain, Iran, Iraq, Jordan, Kuwait, Lebanon, Syria, Oman, Palestine, Qatar, Saudi Arabia, United Arab Emirates, and Yemen. The Olympic Council of Asia's multi-sport event West Asian Games are contested by athletes representing these thirteen countries. Among the region's sports organisations are the West Asia Basketball Association, West Asian Billiards and Snooker Federation, West Asian Football Federation, and the West Asian Tennis Federation. Use of the term in the context of contemporary geopolitics or world economy appears to date from at least the mid-1960s. To the north, the region is delimited from Europe by the Caucasus Mountains, to the southwest, it is delimited from Africa by the Isthmus of Suez, while to the east, the region adjoins Central Asia and South Asia. The Dasht-e Kavir and Dasht-e Lut deserts in eastern Iran naturally delimit the region somewhat from Asia itself. Several major aquifers provide water to large portions of Western Asia. In Saudi Arabia, two large aquifers of Palaeozoic and Triassic origins are located beneath the Jabal Tuwayq mountains and areas west to the Red Sea. Cretaceous and Eocene-origin aquifers are located beneath large portions of central and eastern Saudi Arabia, including Wasia and Biyadh which contain amounts of both fresh water and saline water. Flood or furrow irrigation, as well as sprinkler methods, are extensively used for irrigation, covering nearly 90,000 km2 across Western Asia for agriculture. Also, the Tigris and Euphrates rivers contribute very well. There are two wind phenomena in Western Asia: the sharqi and the shamal. The sharqi (or sharki) is a wind that comes from the south and southeast. It is seasonal, lasting from April to early June, and comes again between late September and November. The winds are dry and dusty, with occasional gusts up to 80 kilometres per hour (50 miles per hour) and often kick up violent sand and dust storms that can carry sand a few thousand meters high, and can close down airports for short periods of time. These winds can last for a full day at the beginning and end of the season, and for several days during the middle of the season. The shamal is a summer northwesterly wind blowing over Iraq and the Persian Gulf states (including Saudi Arabia and Kuwait), often strong during the day, but decreasing at night. This weather effect occurs anywhere from once to several times a year. The most populous countries in the region are Turkey and Iran and, each with around 79 million people, followed by Iraq and Saudi Arabia with around 33 million people each. Numerically, Western Asia is predominantly Arab, Persian, Turkish, and the dominating languages are correspondingly Arabic, Persian and Turkish, each with of the order of 70 million speakers, followed by smaller communities of Kurdish, Azerbaijani, Hebrew, Armenian and Eastern Aramaic. The dominance of Arabic and Turkish is the result of the medieval Arab and Turkic invasions beginning with the Islamic conquests of the 7th century AD, which displaced the formerly dominant Aramaic and Hebrew in the Levant, and Greek in Anatolia, although Hebrew is once again the dominant language in Israel, and Aramaic (spoken largely by Assyrians) and Greek both remain present in their respective territories as minority languages. Other significant native minorities include Assyrians, Druze, Jews, Mandeans, Maronites, Shabaks, Syriac Arameans, Lurs and Yezidis. ^ a b Jerusalem is Israel's de jure capital under Israeli law, as well as its de facto capital by the location of the presidential residence, government offices, supreme court and parliament (Knesset). Jerusalem is the State of Palestine's de jure capital under its "2003 Amended Basic Law" , but not its de facto capital as its government branches are based in Ramallah. The UN and most sovereign states do not recognize Jerusalem as either state's de jure capital under the position that Jerusalem's status is pending future negotiations between Israel and the Palestinian Authority. In practice, therefore, most maintain their embassies in Tel Aviv and its suburbs, or else in suburbs such as Mevaseret Zion outside Jerusalem proper. See CIA Factbook, "Map of Israel" (PDF) and Status of Jerusalem for more information. ^ Miller, David. "West Asia Map". National Geographic Style Manual. National Geographic Society. ^ Maddison, Angus (2004). The World Economy: Historical Statistics. Development Centre Studies. Paris, France: Organisation for Economic Co-operation and Development (OECD) (published 2003). ISBN 978-92-64-10412-9. LCCN 2004371607. OCLC 53465560. ^ United Nations Industrial Development Organization Vienna (UNIDO) (2005). International Yearbook of Industrial Statistics 2015. Cheltenham, UK: Edward Elgar Publishing. p. 14. ISBN 9781784715502. ^ "Standard Country or Area Codes for Statistical Use". Millenniumindicators.un.org. Retrieved 2012-08-25. The UNSD notes that the "assignment of countries or areas to specific groupings is merely for statistical convenience and does not imply any assumption regarding political or other affiliation of countries or territories." ^ "The West Asian Games". Topend Sports. ^ "WAFF Member Associations". The-Waff.com. ^ Muehlberger, Bill. "The Arabian Plate". NASA, Johnson Space Center. Archived from the original on 2007-07-06. ^ "Food and Agriculture Organization (FAO)". ^ "Chapter 7: Middle East and Arid Asia". IPCC Special Report on The Regional Impacts of Climate Change: An Assessment of Vulnerability. United Nations Environment Programme (UNEP), Intergovernmental Panel on Climate Change (IPCC). 2001. Archived from the original on 2016-03-03. Retrieved 2016-02-09. ^ Taru Bahl; M H Syed, eds. (2003). Encyclopaedia of the Muslim World. New Delhi: Anmol Publications. p. 20. ISBN 978-81-261-1419-1. Retrieved 1 February 2009. ^ Sweeney, Jerry J.; William R. Walter (December 1, 1998). "Region #4 — Red Sea Continental Rift Zone" (PDF). Preliminary Definition of Geophysical Regions for the Middle East and North Africa. Lawrence Livermore National Laboratory. p. 8. ^ "ASTER Image Gallery: The Dead Sea". NASA. ^ "GDP". IMF. Retrieved 2014-04-16. ^ "GDP per capita". IMF. Retrieved 2014-04-16.